Travel to Swedish Lapland for snow adventures and a fantastic chance to see the Northern Lights. The areas surrounding Camp Ripan have some of the best records for cloud-free nights and the resort’s north-facing cabins afford some of the best views of the Aurora when they show. Whatever you wish-list of winter activities, Camp Ripan offers them all. On arrival in Swedish Lapland you will be met by your local guide and transferred to Camp Ripan. Once settled familiarise yourself with the hotel and its surroundings, before enjoying a 3-course dinner served in Restaurant Ripan. After dinner head to the Northern Lights room, where you can relax and unwind watching an informative slideshow – remember to take a peek outside for the real thing before you retire. After breakfast, experience your first Arctic adventure – a husky dogsledding excursion. It is just a short transfer to the huskies rustic home, where you will have ample time to meet and greet your four-legged friends and their puppies. All of them will be excited to be going out for their morning run, so after instruction you will head out onto the surrounding tracks. Driving in pairs, you will have the chance to swop and act as musher’s, whilst also being able to take in the Arctic landscape. You soon settle into a gentle and soothing rhythm with just your shouted instructions and the dogs panting to accompany you. Half-way the dogs rest as you enjoy a hot drink served in a traditional Sami tipi complete with roaring fire. Make sure you keep an eye out for other Arctic wildlife such as the reindeer and elusive moose on your return to the lodge. Lunch is at your leisure and the afternoon is at your leisure. Later you have the opportunity to visit the Aurora Spa. 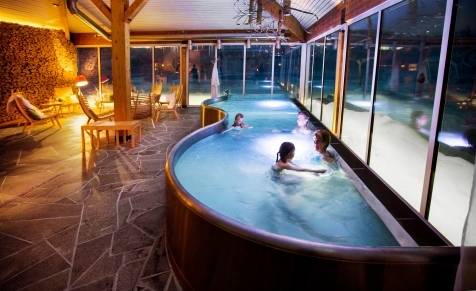 Relax indoors and enjoy the winter landscape through the panoramic windows and experience the warming comfort of the outdoor pool and if you are lucky, catch a display of the Aurora Borealis. You are provided with an Aurora bucket of scrubs and oils to self-minister whilst conducting the Stävan Spa Ritual. The spa is open from 16.00 – 22.00, giving you the choice to relax before or after this evening’s dinner. Choose to unwind in the comfort of you cabin or take part in one of the many optional excursions on offer. Join a guided snow shoe tour, learn the art of cross-country skiing or enjoy a reindeer ride through the winter landscape surrounding Camp Ripan. This evening we have included a northern lights hunt by snowmobile. After full instruction, your expert guide will lead you into the polar night in search of the aurora borealis. If conditions are right, you will be rewarded with a dancing display of this incredible phenomena. A stop is made, giving you the opportunity to swop drivers and fortify yourself with a hot drink and a snack. Returning to the hotel, dinner is served in the restaurant and your evening is free to reflect on your incredible stay. Morning at leisure before a short transfer back to Kiruna airport ready for your return flight back to the UK. 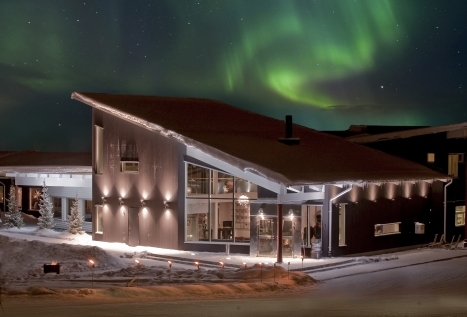 The Lind families’ Camp Ripan is set amongst a forested landscape on the outskirts of Kiruna. Cosy, contemporary cabins, each with their own door, are scattered around a main reception. The hotel style building greets you with a welcoming open fire and provides a calming enclave where you can relax pre or post tour and dinner. An innovative restaurant showcases delicious regional menus and the Arctic spa is the perfect place to unwind with its indoor and outdoor pools, sauna’s and relaxation area. Panoramic windows reveal the luminous landscape at every turn, creating a perfect blend of winter and warmth. Giron cabins have 2 rooms, a small twin bedroom and open plan sitting room. Each has a shower/WC, cable TV, WI-FI, telephone and clothes drying cupboard. 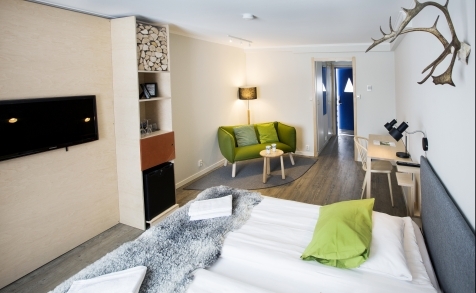 Kiruna cabins have newly been refurbished and are open plan with a double bed and a sofa bed. Each has a shower/WC, cable TV, WI-FI and telephone. Snow shoes are easy to master and enable you to explore otherwise inaccessible areas as you follow the footprints of the hare or mountain ptarmigan over a thick blanket of snow. Guided tour. Coffee and sandwiches included. Learn the basics of cross-country skiing before heading out independently on tracks close to Camp Ripan. Take a short transfer from Camp Ripan to a nearby horse farm, where, together you will prepare the horses for riding. Head out into the winter landscape in search of clear skies and, if the conditions are right, a display of the aurora. The ride takes you through ancient forest nestled against a mountain range. On returning to the farm a dinner comprising local specialties will be served, as your host tells you of the local Sami culture and life in Swedish Lapland. Take a short transfer to a nearby horse farm where you will prepare your Icelandic horse for riding. You will then head out on a tour through the forest in search of moose. After your ride, head back for lunch at the farm before your transfer back to Camp Ripan. Riding experience is not necessary, but you do need to be in good physical health. The snowmobile is one of the most common forms of transport during the winter months in Swedish Lapland. Experience the thrill of driving a snowmobile through the low mountain areas close by to Camp Ripan. There is an opportunity to swop drivers as you take a break for a light snack around an open fire, before returning back to the hotel.